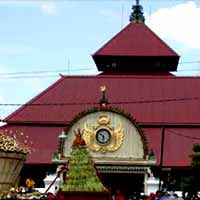 Java Culture still hold strategic role in cultural investigation strategy. Hence, “ farm struggling” above his(its difficult to be obviated. Often happened conflict of interest between power hegemonies, cultural hegemony, and spirit [of] taking care of cultural value independency from various form of interventions. In the collision, Java culture values often difficult to be catched. Particularly having the character of imateriil, for example kawruh soul, a portrait Ki Ageng Suryomentaram and Raden Ngabehi Ranggawarsita, which so(after dull before contemporary generation. this book contains thing more circumstantial. Swoops to ruh carrying out of itself Java human life, as main pillar. He is not anymore frill or accessory which must be glued at modern civilization, but becoming elan and main pillar of culture strategy faces change. Through this book, Darmanto tries compiles value chips kejawaan to become embryo the psychology theory to comprehend more circumstantially behavior and Java culture. More specifically again, s(he tries mereaktualisation of Java psychology and seats it is on an equal with the modern psychology theory, what confessed it is what a the duty weight. Insufficient merely love to Java, in consequence can have a meaning (of) cultural chauvinism. Nor enough by exploiting spirit [of] dekonstruksi to the modern psychologies theory and also spirit [of] anti “ cognate imperialism”, as great as confirming Java psychology as original psychology science ( indegenous psychology). Dekonstruksi acap identical times with chaos, or likely answers one chaoses with thing also intruding. Required a culture power ( read: science) which redemtif – is having the character of redeemer – and not koersif – which forces, to seat this Java psychology on an equal with modern psychology. This book only eksplisitasi and systematization Kawruh Jiwa Jawa became Java psychology, that can dialogue in equivalent analysis plain by what is named modern psychology. Spirit [of] also bases on rising of this book is science nationalism. Nationalism urgency in scientific world of course can be disputed. But, to fill psychology reading arena mengindonesia, such my buku-bu of course needs. Psiklogi Indonesia so far is import psychology relying on values “ objective, universal, and free assessed”, while values crumb “ transubjektif, istorikal, and rich assessed”. Hence, need to be dug psychology which berurat-akar at prosperity of Indonesia public x'self. Because Darmanto coincidently Javanese, lifted Java psychology as in perpective bargain has just in exploration of theory. Like cultural tolerance of ala the advocate dekonstruksi, Java Psychology also offers full freedom to reader to put down his own perception: will Java psychology be made alternative, or combined with the modern psychology theory. What is clear, approach of psychology which more humanitarian hardly needing, when development felt increasingly mengimaterialkan man. Darmanto compiles this book through scientific research procedure, which notabene comes from West. In consequence, imprecise also if it is told that Java psychology secedes from scientific mainstream of West. At least, “ ketertundukan” at the scientific procedure, indicates an effort to operate on psychological values of Javanese by using others scalpel. Does wrong this, fairly not becomes problem, as far as not happened distortion. In book ending, s(he cites utterance Ki Ageng Soerjomentaram, that: “ above earth, below(under sky, no thing need to be searched furioslyly, or refused furioslyly”. a democratization mirror of culture? This research based on spirit [of] “ to experience the evidence”, and “ ngelmu my i kelakone kanthi implementation”. This is primal teaching Ki Ageng. Very identical with West motto: “ no pain - no gain”. Attentional simply not merely execution a morale doctrine, but also a method to comprehend psychological processs of man. Hence “ rehabilitation of introspection” ( read: attentional) as valid method in psychology can be told as conclusion, likely, also able to be suggested as fomentation. Attentional ( mulatto sarira) as one of vital teaching in Java psychology, perhaps recipe ampuh to eradicate cultural disease now knocks over our public: often burdens mistake to others. Simply, elan Java psychology ready to give contribution that is is not a few to heal civilization from disease like corruption, collution, manipulation, hipokrisi, and so. Then, whom will propose Darmanto, Karkono “ Kamajaya”, and or Geertz, Feith, Mulder and Magnis, what follows and preserves tradition of master Ranggawarsita, for then tries makes Java art which eksploratif alternatively cultural strategy in enriching cultural interpretation efforts and Java philosophy for importance of management in front?